Space the final frontier. Ehhh, maybe. But I say it is the only frontier. I know the show/movie in whose motto (or mantra) that that is was talking about man’s need to explore/move on. I am talking about space on a more personal level. The space that is around you right now. You sitting behind a computer, or reading this from your phone, or looking at it on whatever type of information type device you got. Yes, your personal space. Or as a selfish, surfer dude would say in a 70’s sitcom would say ‘Like whoa chick I need my space’. We want to control the space around us, and in the 1980 in the United States an invention came onto the market that helped us control that space immensely. I am of course talking about the Sony Walkman. With this you were able to fortify yourself against the world, listen to what you wanted to, and screen out the outside world with relative ease. 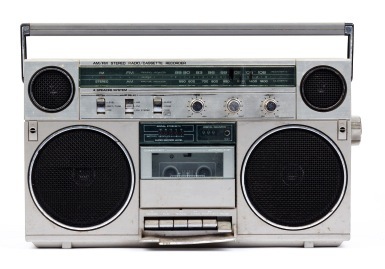 Unlike the other popular music device of the day, the boom box, this created your own little world which you had control over. The boom box, black and chrome, a plastic behemoth with large speakers blaring Van Halen, invading a space, influencing those in it, sometimes trying to overwhelm all that came within range. The Walkman instead was castle, a portable castle that you could use to screen out all and every other thing that you did not want to deal with on the auditory front. And if you were walking as the name implied, or even running you could control your space to an even greater degree by distancing yourself from what you found distasteful. I remember going into my room, putting on the headphones, putting in a tape and my mother did not know where I was. She could yell and yell all she wanted, but until she actually climbed the stairs, and opened the door to my room she did not exist for me. I was a boy alone with Phil Collins. (well that sounded okay until I read it out loud). Now if had been using my boom box, she would know I was home without a doubt, and I was up in my room. The Walkman was great, I could control my space. But we all want to control “our space”, we don’t want too many people in our personal space, and the ones we want in that space have to meet certain criteria. Among these but in no particular order are, hygiene, invitation, and space available. Hygiene: Has the person bathed recently. Are they clean? I don’t know about you but I am not a touchy feely person and will hug a person maybe, upon greeting and upon leaving. I took a trip back to Hawaii and was reunited with an old comrade from the Army; this guy had meant a lot to me, a bit of a mentor, someone who I would hug after not seeing for a number of years. But, I am standing in front of the hotel we were both staying at, I knew he was around but had not seen him yet. I spot him; he is just coming back from a run. He was dripping in sweat, so instead of hugging him, I just gave him a great handshake. I kind of regret it. I should have hugged my old friend, I should have pounded him on the back like old soldiers do. Invitation: Does the person want you in their personal space, a lot of people like to keep their distance, it is a very few that most people let in. Someone in your personal space means a type of intimacy. Intimacy has gotten sexualized over the years. Like ‘Are you two intimate?” But in reality all it means is close familiarity, friendship or closeness. I bet almost everyone remembers the first time someone outside of you family was invited into your personal space, once you figured out you had personal space. The first time a girl or guy that held your hand as you walked along. The first slow dance with a person. Your heart is racing, maybe your get a little sweaty, it is a big deal. Space Available: This is one thing we don’t have control over, unless we avoid people all together. Avoiding crowded elevators or the Metro in Washington D.C on the 4th of July after the fireworks, or the trains in Seoul, Korea altogether. But to the point, we all want to control the space around us, but I encourage you to live life like you mean it. I should have hugged my old friend, I should let kids climb over me, because without these things, these interactions with our fellow travelers in life, life is not so sweet, life is not so good. Personal space means something, it is important, but someone in your personal space means even more.